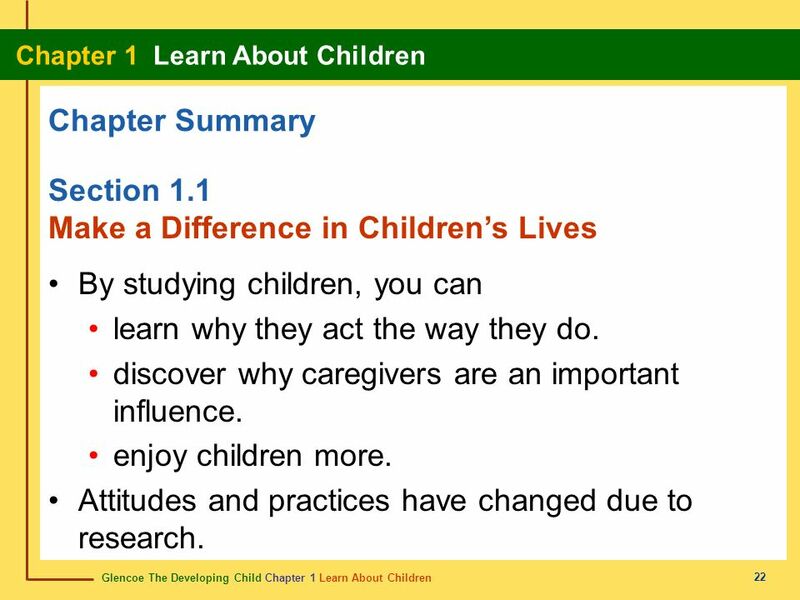 Understand why children do what they do. 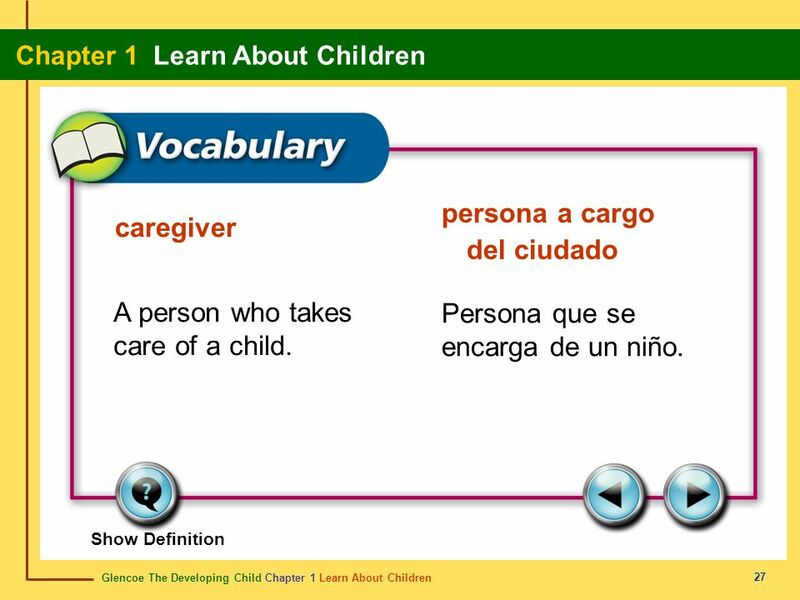 Taking care of children is one of the most important responsibilities you can have. Learn job skills by working with children. 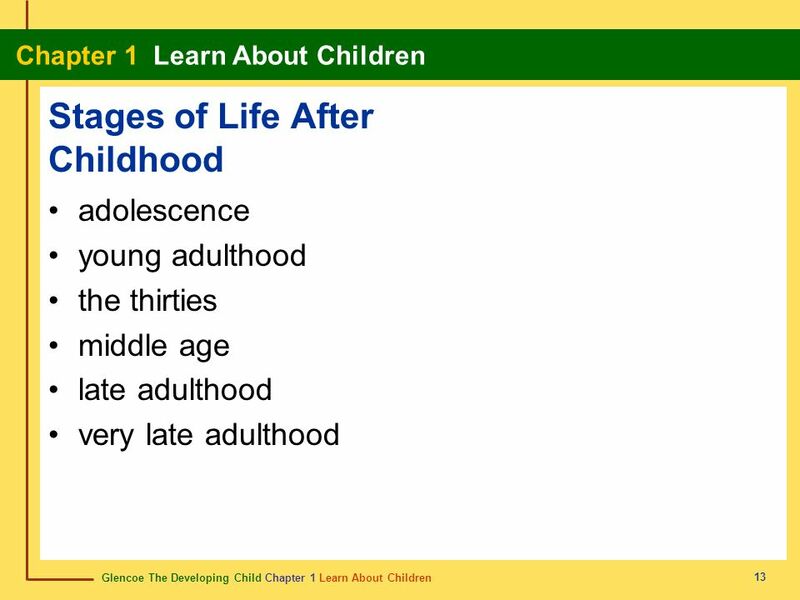 Better understand yourself by evaluating your own childhood. 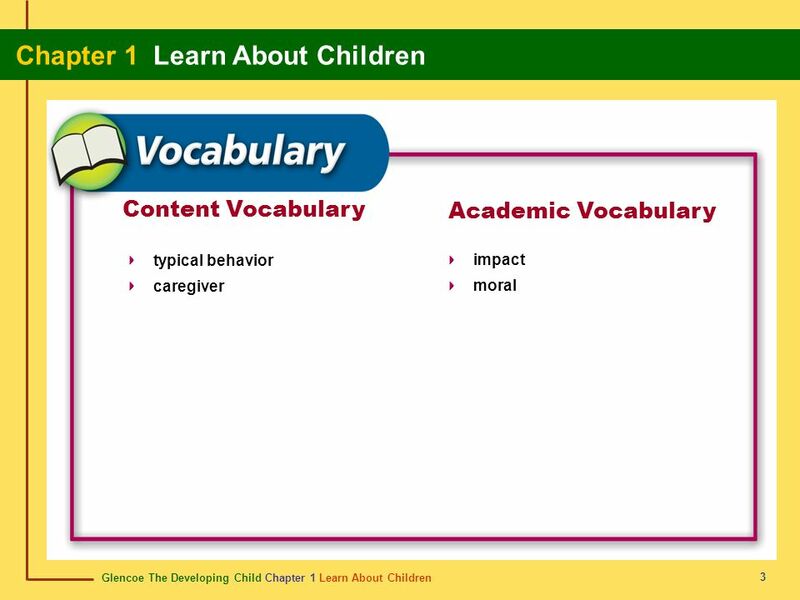 How do you think learning about children can help you understand yourself? 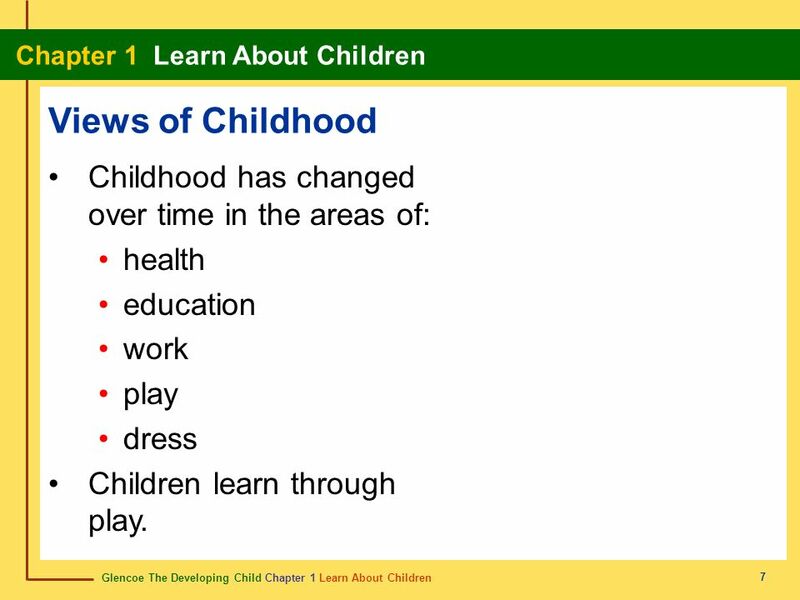 health education work play dress Children learn through play. 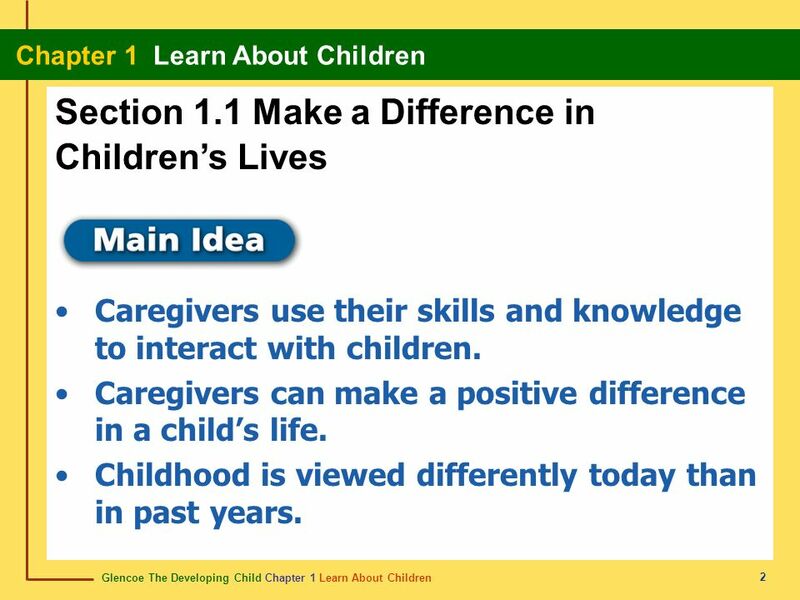 Childhood is an important time of physical, mental, and emotional development. 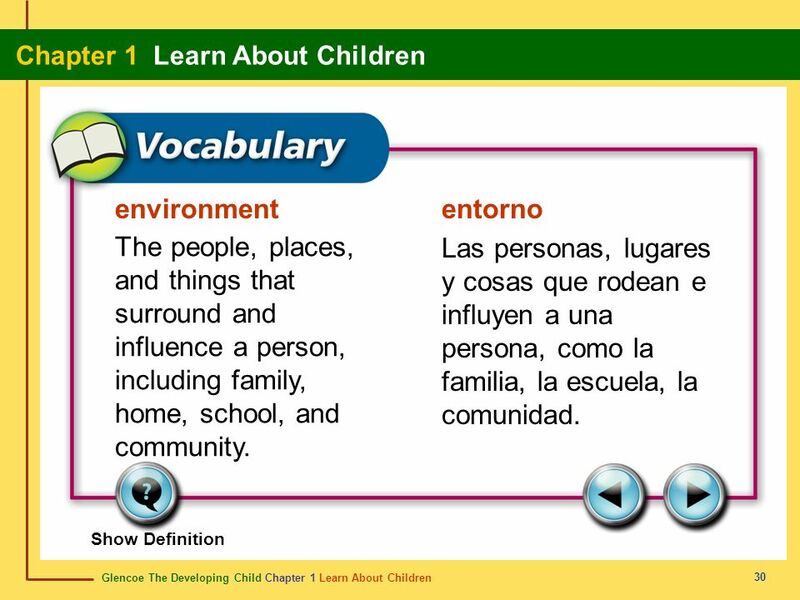 A child’s heredity and environment affect development. Development continues throughout the life cycle. 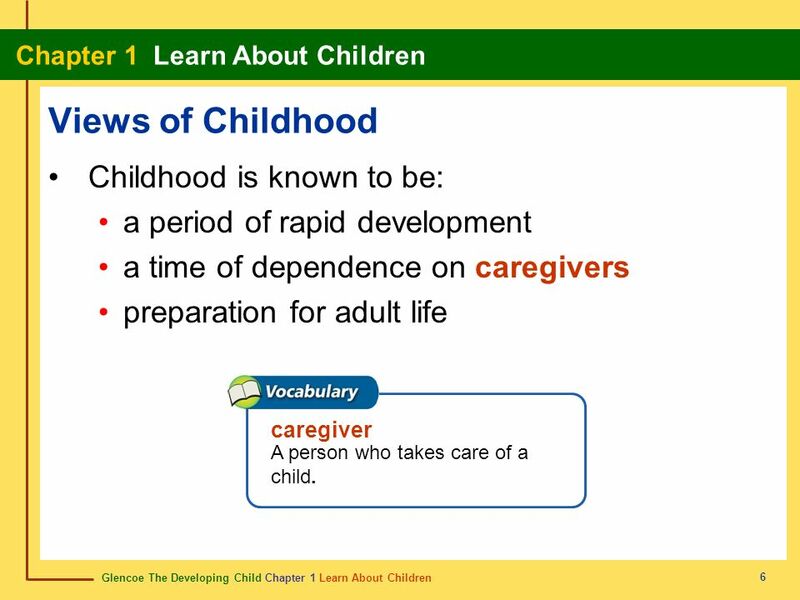 Childhood prepares us for adulthood. 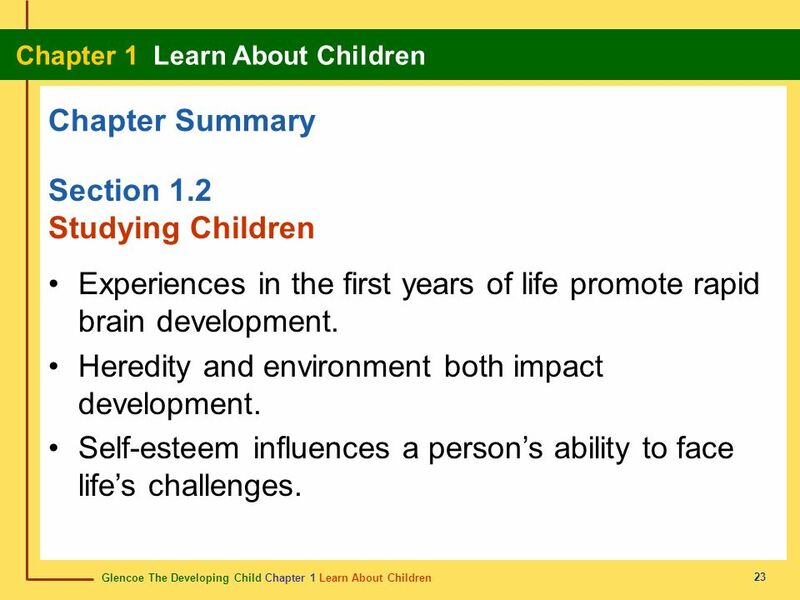 Babies receiving stimulation develop more quickly and have a more secure self-image. 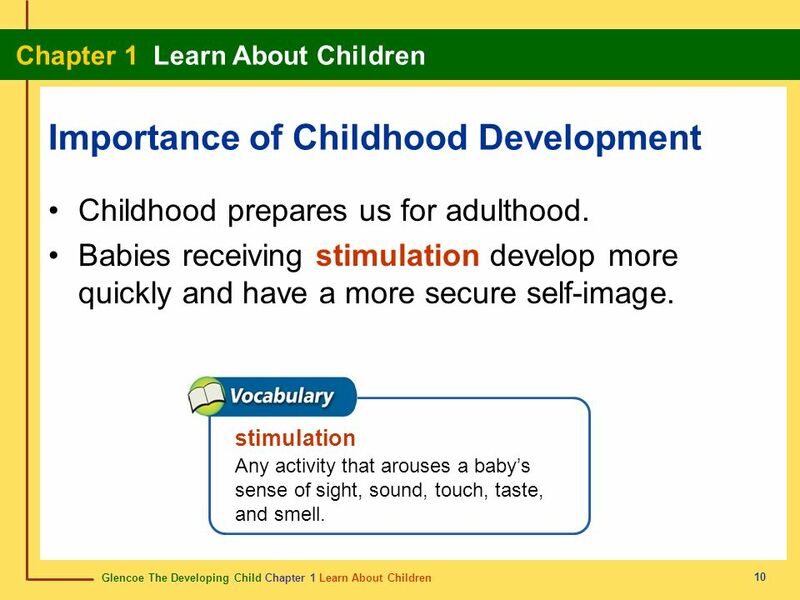 stimulation Any activity that arouses a baby’s sense of sight, sound, touch, taste, and smell. 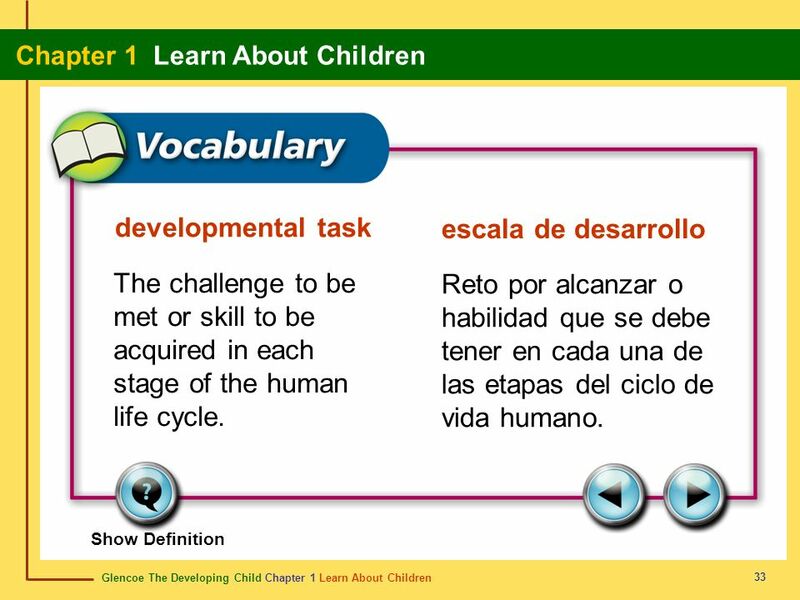 Development builds upon earlier learning and proceeds at an individual rate. Development continues throughout life. 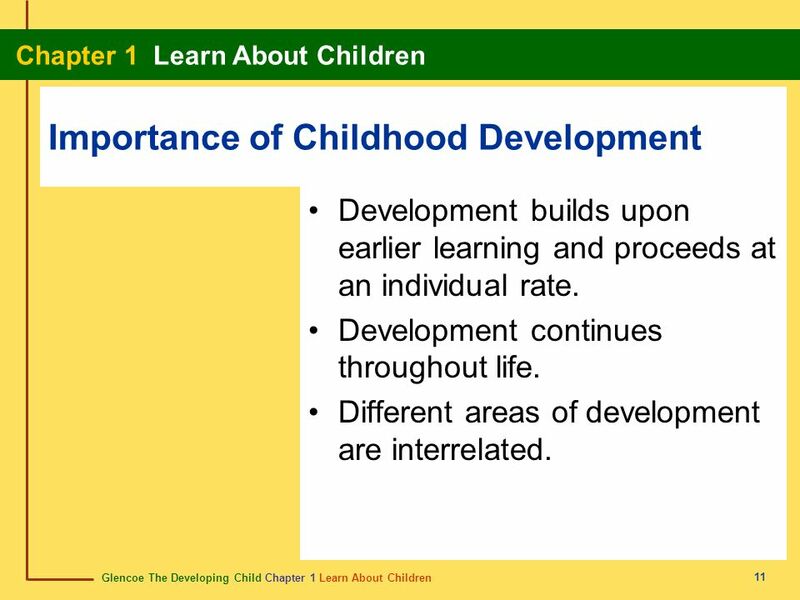 Different areas of development are interrelated. 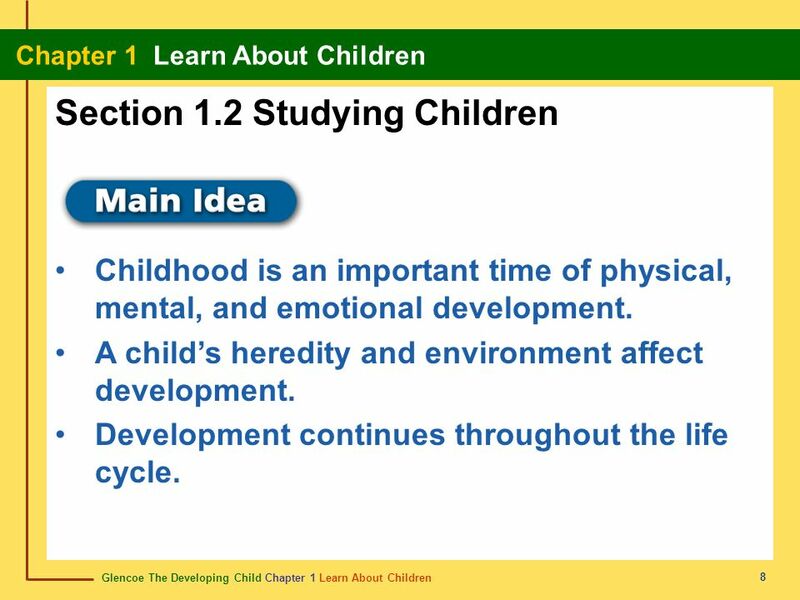 Heredity and environment influence a child’s development. Self-esteem affects the ability to handle challenges. 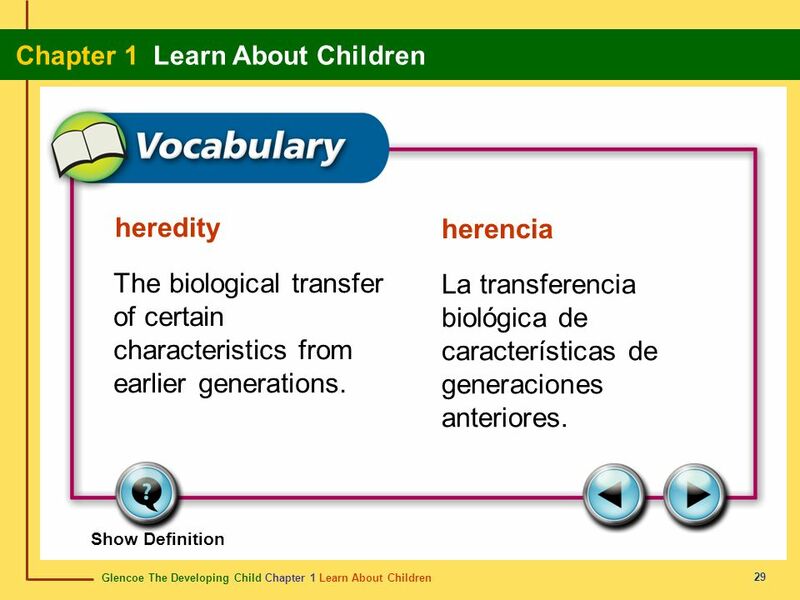 heredity The biological transfer of certain characteristics from earlier generations. self-esteem Self-worth; the value people place on themselves. 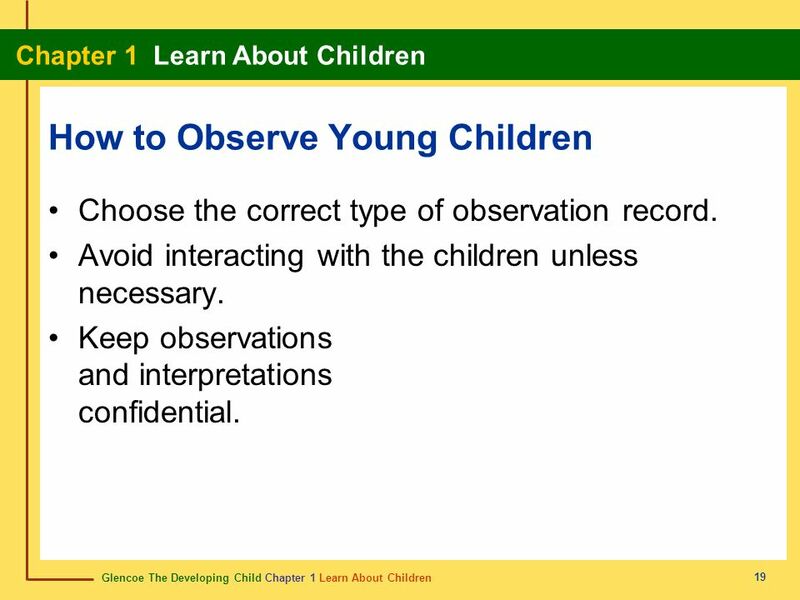 16 Why Observe Children? 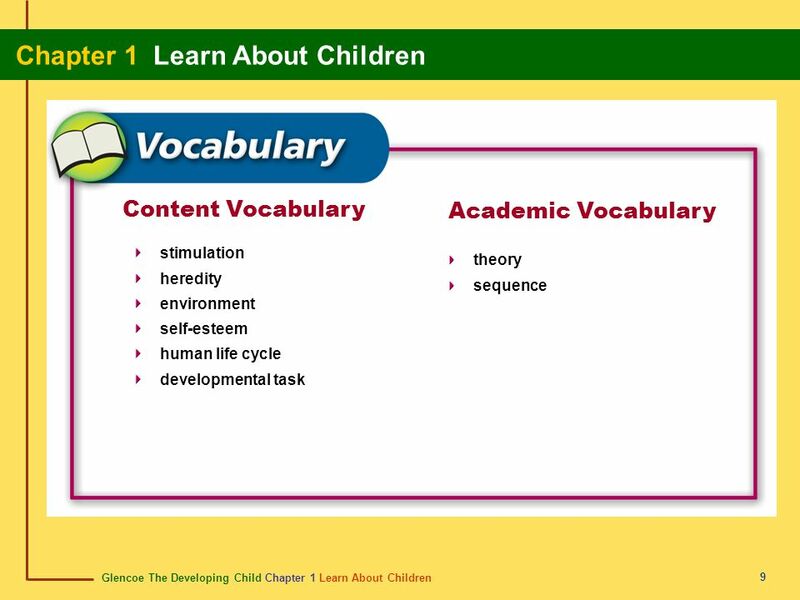 We learn more by observing than by reading. 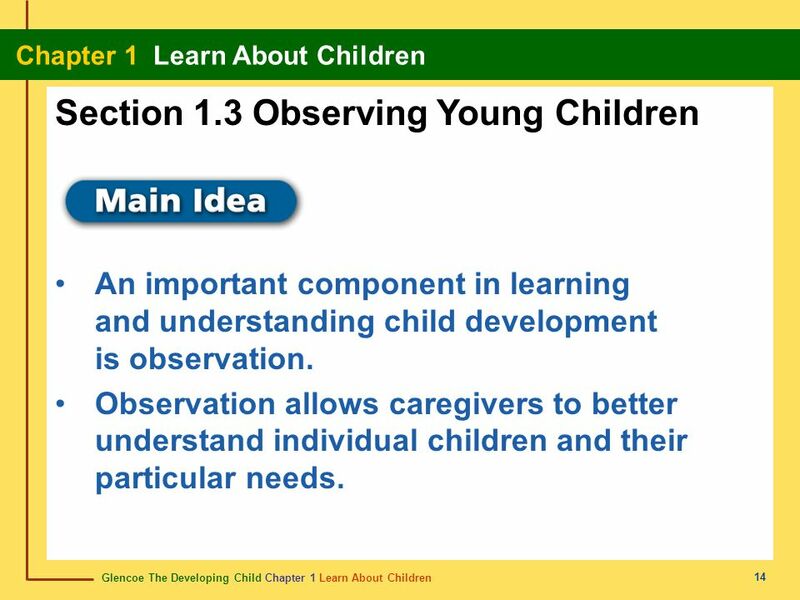 Observing allows you to see personalities. Separate fact from opinion. 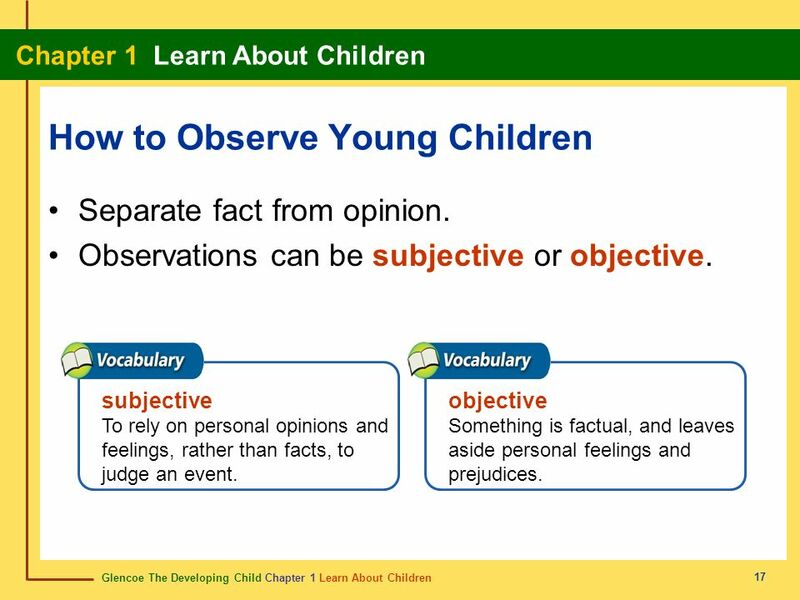 Observations can be subjective or objective. subjective To rely on personal opinions and feelings, rather than facts, to judge an event. objective Something is factual, and leaves aside personal feelings and prejudices. 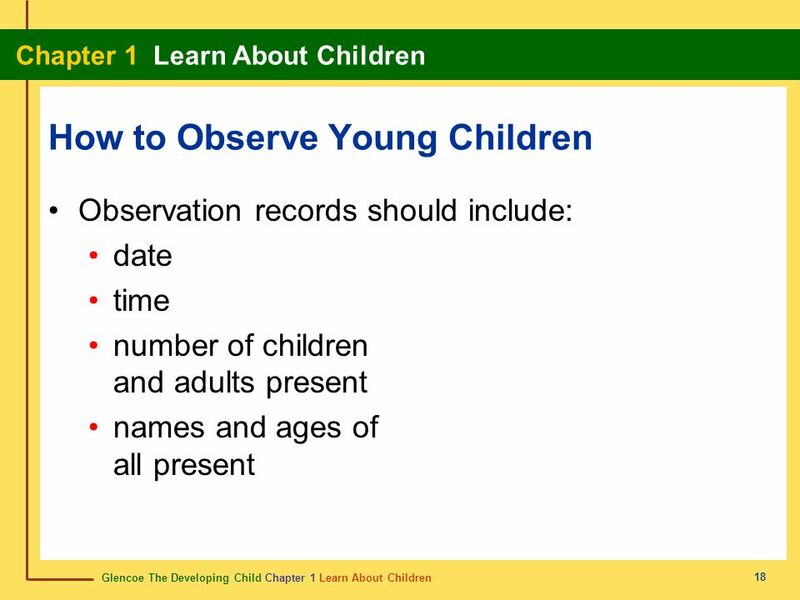 Choose the correct type of observation record. Avoid interacting with the children unless necessary. 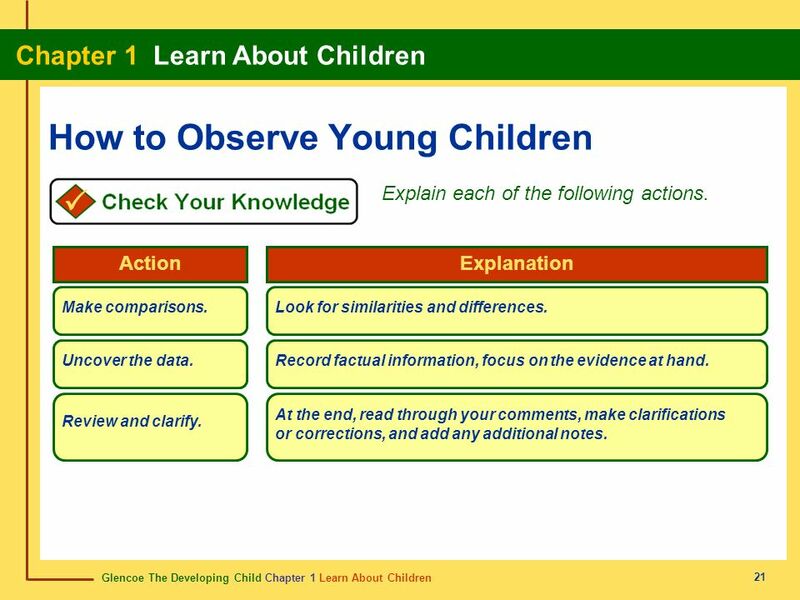 Keep observations and interpretations confidential. Explain each of the following actions. Action Explanation Know your purpose. 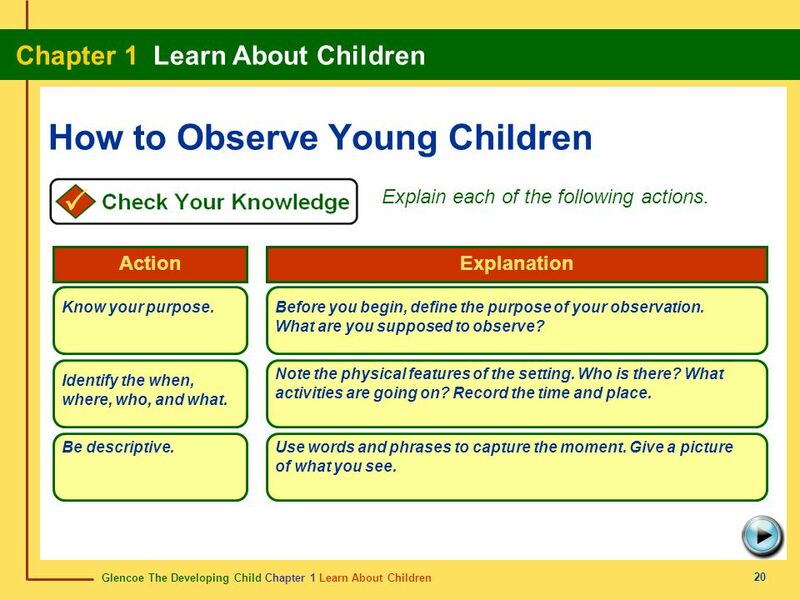 Before you begin, define the purpose of your observation. What are you supposed to observe? Note the physical features of the setting. Who is there? What activities are going on? Record the time and place. Identify the when, where, who, and what. Be descriptive. Use words and phrases to capture the moment. Give a picture of what you see. 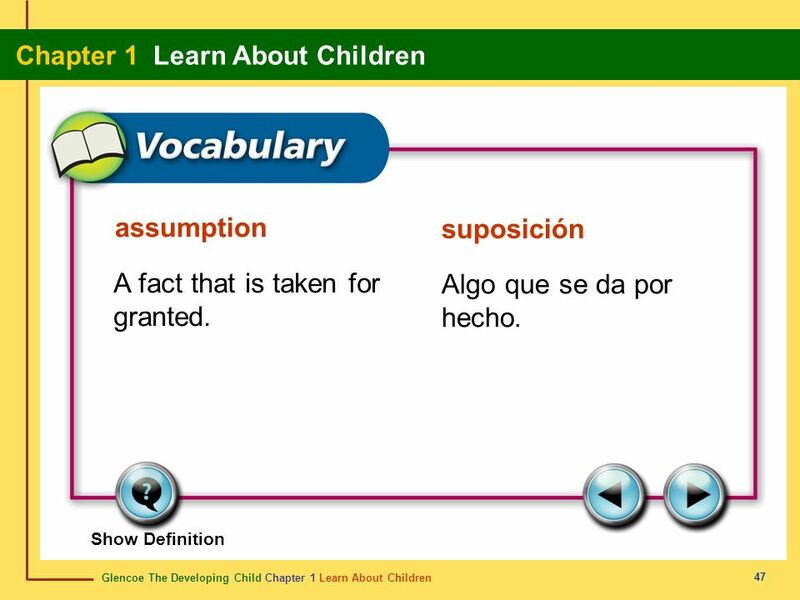 Explain each of the following actions. 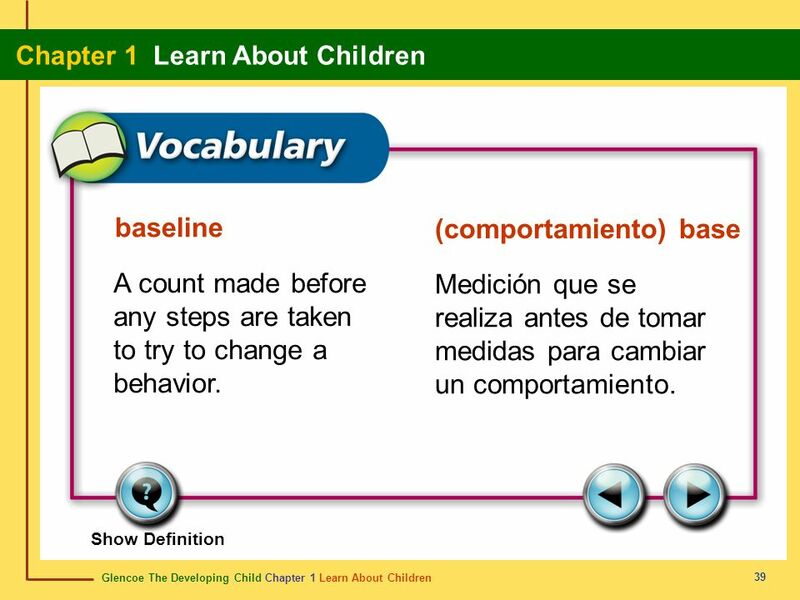 Action Explanation Make comparisons. Look for similarities and differences. Uncover the data. Record factual information, focus on the evidence at hand. 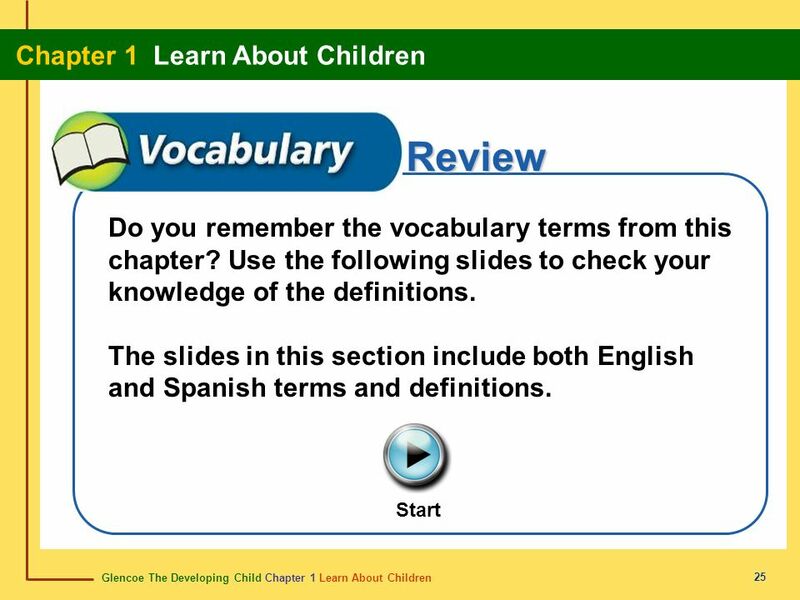 At the end, read through your comments, make clarifications or corrections, and add any additional notes. 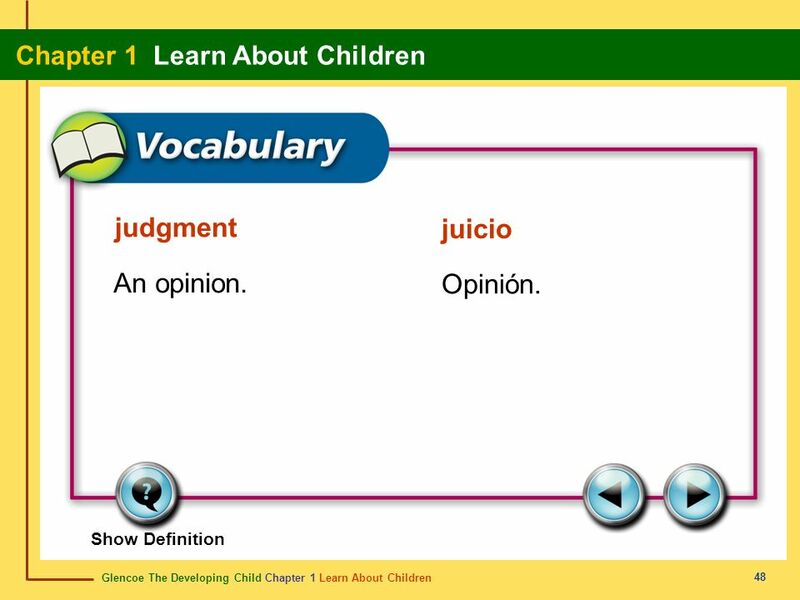 Review and clarify. 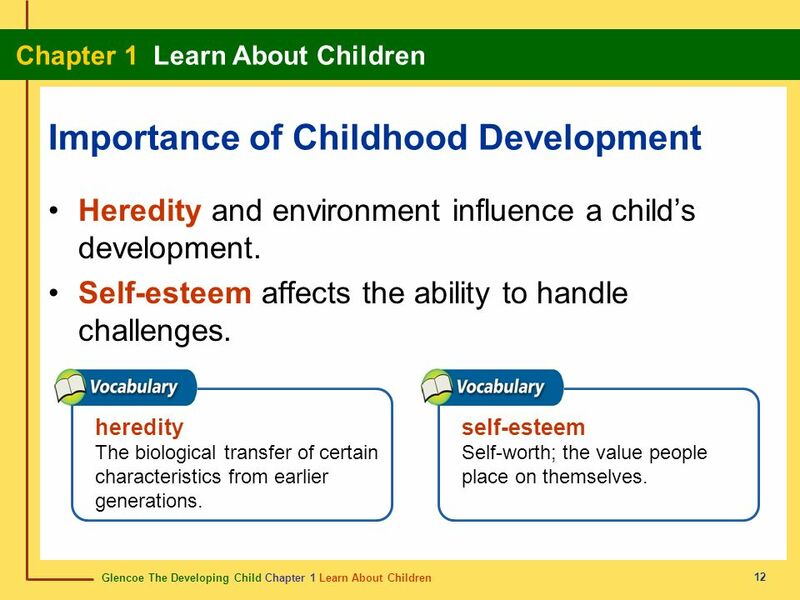 23 Heredity and environment both impact development. 31 Self-worth; the value people place on themselves. 36 A record of everything observed for a set period, such as 15 minutes. 38 A tally of how often a certain behavior occurs. 41 The analysis an observer forms and expresses about what was observed. 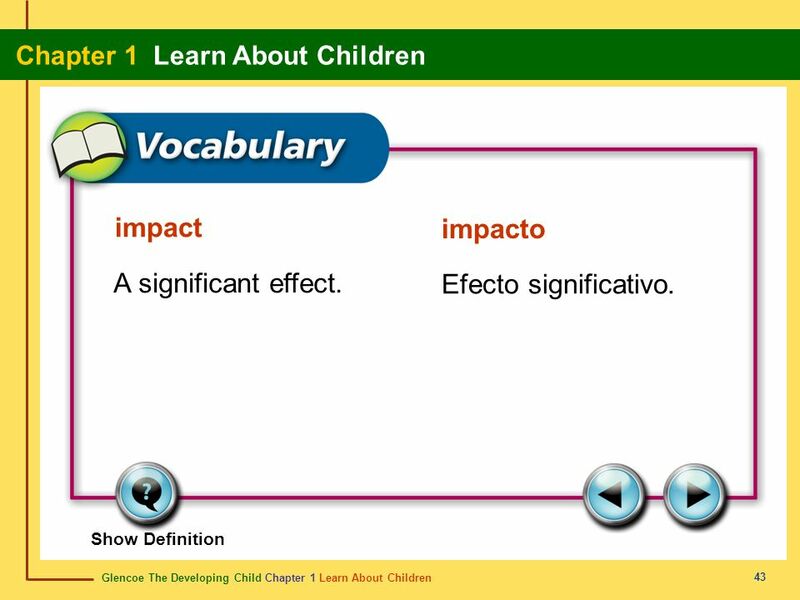 43 impact impacto A significant effect. Efecto significativo. 44 Ethical; relating to issues of right and wrong. 45 A belief; an abstract thought or idea. 47 A fact that is taken for granted. Algo que se da por hecho. 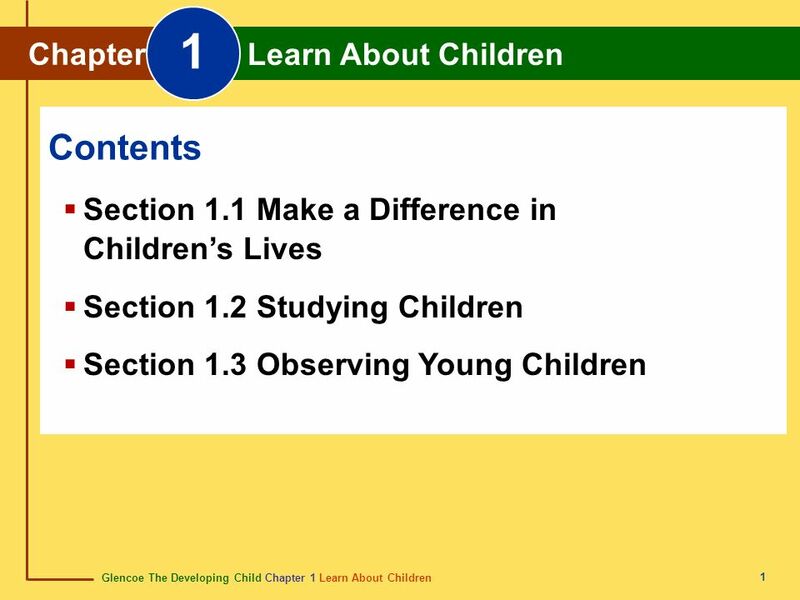 Download ppt "1 Contents Chapter Learn About Children"